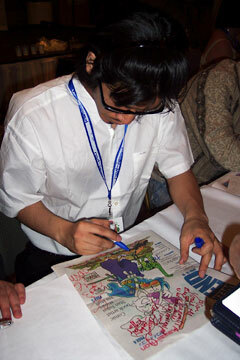 Jin Kobayashi signed autographs for fans. Love at any age is a magical concept, but perhaps the most enchanting love of all comes when someone develops his or her first crush in high school. Take Kenji Harima, one of the main characters in the manga (Japanese comic) and anime (Japanese animation) series "School Rumble." Ever since he first saw Tenma Tsukamoto, he gets weak in the knees every time he thinks about her, yet he's too nervous to tell her, face to face, that he loves her. He sends anonymous love poems, tries to figure out ways that he can conveniently be in the same place where she is at the same time, and looks for opportunities to subtly get her to like him. Oh, yes, and he's a high school delinquent who inspires fear in the hearts of his classmates and bashes in a few heads every now and then. "Well, high school delinquents fall in love, too," manga artist Jin Kobayashi told an audience in April via translator at Kawaii Kon, the annual anime convention held in Honolulu (and the first convention he's attended in the U.S.). "The gap seemed to be interesting, so that's how I (came up with that). ... So I took it to my own liberty to introduce a high school delinquent and make my own high school love comedy type of manga and see where it could evolve from there." Thus was born "School Rumble," a comedic tale of high school and all of the love not-quite-connections that take place there. The series, which is serialized in Weekly Shonen Magazine in Japan, is Kobayashi's first professional work. While he grew up sketching anime characters from some of his favorite series like "Doraemon" (the long-running story of a boy and his robotic cat) and "Dragon Ball Z," it wasn't until he joined a group of amateur comic artists at his university that he became serious about drawing manga. Even then, he felt he could parlay his experience into a career as an illustrator or an animator rather than a professional manga artist. It took a suggestion from a staff member at Kodansha -- publishers of Weekly Shonen Magazine -- that convinced him to turn in a 30-page original manga for the company's new artists' competition. While he didn't win, the positive feedback he received eventually planted the seeds for "School Rumble." 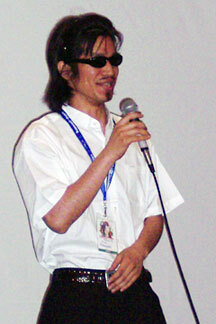 Kobayashi at the annual anime convention held earlier this year. THE EARLY chapters of "School Rumble" play out like a mix of a Wile E. Coyote/Road Runner cartoon and a romantic comedy. While Harima is pining for Tenma, Tenma is equally obsessed with someone else: Oji Karasuma, a boy who is often so obsessed with what he's doing that he's oblivious to anything going on around him. Yet Tenma tries her hardest -- some casual observers might even say too hard -- to get Karasuma to notice her. In one instance a simple love letter turns into a large scroll that takes Karasuma several hours to read (twice, and only because he double-checked to see that, indeed, she forgot to sign it). She also obsesses over drawing him in art class, stays in the ladies' room for hours because she doesn't want him to see her emerging from there, and even takes up archery to try to deliver a message that way. » Yakumo Tsukamoto, Tenma's quiet younger sister, who seems older and more mature than Tenma in many ways. » Eri Sawachika, Tenma's friend and a rich mixed-race girl who recently returned to Japan after living in England for some time. She also tends to be blunt at times in sharing her opinions, a common trait in Japanese stereotypes of Western Europeans. » Mikoto Suo and Akira Takano, two more of Tenma's good friends. » Itoko Osakabe, a physics teacher and cousin of Harima who is possibly the only person who can keep Harima in his place. IT WOULD take up more space than what is available here to print a full list of characters that have shown up in this series -- and besides, not all of them have been formally introduced in the translated English manga. Suffice it to say that there are 47 unique characters listed in the series' entry in the Wikipedia online encyclopedia. Yet in spite of having to juggle all these characters, Kobayashi manages to craft individual personalities for each of them. The series' strength lies in the extremes to which he plays up simple misunderstandings. He credited his personal experience as inspiration for crafting the "School Rumble" cast. "A lot of the characters in my manga are based on my own high school, as I recall my own high school memories," Kobayashi said. "Some of the characters, I recalled some of my friends, like, 'Oh yeah, I remember that guy, he used to be kind of like this.'" With the success of the "School Rumble" manga, an anime version soon followed in October 2004. The first 26-episode season proved popular enough to warrant production of a second season currently airing in Japan. The news that his manga was becoming an anime initially surprised and worried Kobayashi. "When I first learned that 'School Rumble' was going to be animated, I was thinking, 'Wow, for real?' and on the other side I was thinking, 'Damn, is my publisher nuts? What are they thinking?'" Kobayashi said. A visit to the production studios and watching the recording sessions soon eased his fears. "Now that I think of it, I'm beginning to think more and more that maybe my original 'School Rumble' manga was fairly easy to be adapted into anime," Kobayashi said. "The people who brought the manga to life, into animated form, did it really well, and I was really impressed. I was just surprised at the work." Del Rey Manga is publishing the English-translated manga in America, with two volumes already out and a third due Aug. 29. Funimation recently licensed the anime, with a tentative release date of January 2007.